We're very pleased to be showcasing Wild and Alive Chocolate, an onine all-vegan, raw and organic chocolatier. We recently connected with Judith Whiting, Wild and Alive's co-founder/owner. VegDining: Thank you Judith for finding time to chat with us, especially at this very busy time of year as we approach Valentine's! Let's start with how Wild and Alive got started. Wild and Alive: We've been talking about starting a raw vegan organic food business for years. David, my husband and co-owner, has been researching alternative health modalities and healthy lifestyles since the early 90s, which culminated in attaining a Bachelor's of Naturopathy, along with diplomas in Nutrition & Herbalism, from the top Natural Therapies College in New Zealand. Vegetarian since 1990 and vegan since the late 90s, David's first significant time of living raw was a blistery Maine winter in '99 and, contrary to dire predictions, never felt better or warmer! In 2003, ensnared by David's phenomenal raw lemon pudding, I started experimenting with raw food dishes and filling the void left by the absence of bread, pasta and Streuselkuchen with raw scrumptiosity. We kept busy ping-ponging between the US and New Zealand, visiting my family in Germany, working in health food stores, birthing and parenting, going on tour with Dave's band and other some such. But in 2016 it was finally time to start this long-bepondered food business and so we did! VegDining: What made you decide to do vegan-raw-organic chocolate? Wild and Alive: Having worked in the health food industry for decades, organic has become an non-negotiable for us. Every time we buy groceries, we cast a vote for sustainable farming, protecting our environment & the animals we share it with, and farm workers' & our own continued good health. As long-term vegans and raw foodists, it was obvious that our products would have to fit our lifestyle too. Chocolate seemed to be a good place to start. I mean, who doesn't like chocolate? It's an amazing substance with significant health benefits, particularly if minimally processed. VegDining: So the key is to work with "raw" chocolate then. How can chocolate be raw and what makes that healthful? Wild and Alive: In reference to cacao, 'raw' means that the cacao beans have not been roasted. The beans get scooped out of their pod and then dried and fermented. They have a heavenly aroma and pack a surprising nutritional punch. Raw cacao has a huge Oxygen Radical Absorption Capacity (ORAC), surpassing even bee pollen, wild blueberries and goji berries. It's the best source for magnesium known, which increases brainpower, supports the heart, helps build strong bones and increases flexibility. Cacao also contains iron, chromium, manganese, zinc, copper, omega-6 fatty acids, vitamin c, serotonin and fiber. And because it likes to go the extra mile, cacao also contains phenylethylamine and anandamide, so-called bliss chemicals, leaving you subtly happy and alert. When you roast the beans, you lose some of the nutritional benefits while creating toxic by-products. That's why we prefer our cacao raw! VegDining: And so your other ingredients would be raw too? Wild and Alive: The same goes for the nuts and seeds in our fillings. They are soaked, and then dehydrated slowly at low temperatures to maintain optimal nutrition, flavor and digestion. Soaking the nuts mimics nature, where nuts that fall off the tree in autumn begin to germinate and grow when exposed to the moisture and warmth of spring. This process disables tannins and toxins inside the nut that were keeping it from premature sprouting, leaving a lighter, easier-to-digest nut with enhanced nutrient availability. VegDining: What else differentiates your treats from other chocolate products on the market? Wild and Alive: Our chocolates are handmade in small batches and are certified organic. The ingredients are not only recognizable, but healthful too! Unroasted (aka raw) cacao, coconut sugar and a smidgen of sea salt are stone-ground into silky smooth dark chocolate and then combined with sumptuously rich fillings. The cashews, almonds, hazelnuts and walnuts are activated through soaking and drying, boosting their nutritional benefits while making them easier to digest. Our bars are not only paleo, vegan, gluten-free, soy-free, organic, non-GMO, contain no additives or refined sugar, but are also fiendishly delectable. VegDining: At the time of our chat, Valentine's Day's approaching. What kind of treats does Wild and Alive offer for that special occasion? Wild and Alive: Our favorite little Valentine's box! 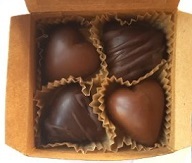 Each adorable 1.78oz box contains 4 delicious raw vegan organic chocolate hearts: 2 dark chocolate hearts with Aztec fudge filling and 2 coconut mylk chocolate hearts filled with cashew maple caramel. Then there is our regular range of filled and solid raw vegan organic chocolate bars! All of them make a yummy gift for any occasion. VegDining: How do you deliver your chocolates to your customers? Wild and Alive: We ship our bars USPS priority. That way they're guaranteed to arrive within 3 business days. For example, if you order by Friday 8th February, you'll receive your bars before Valentine's Day. If you miss a deadline, just send us a message at hello@wildandaliveorganics.com and we can possibly work out an alternative shipping service. VegDining: This has been very interesting ... Plans for the future, maybe a rest after Valentine's?!? Wild and Alive: Ooooh, that sounds tempting! No rest coming up for us yet though :-). We're working on expanding our product line this year to include herbal chocolate bars, a CBD bar, raw cookies, and crackers. And then it's not that far until Easter! VegDining salutes Wild and Alive for all it does to bring raw, organic, vegan treats to North America! Learn more about Wild and Alive from their Full Listing on our site. Photos courtesy of Wild and Alive.